The Township had someone out power-cleaning the swings at our local park a few days ago. 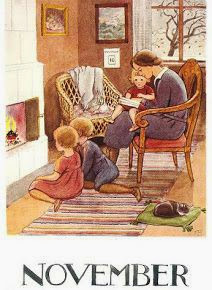 Adults hastened away from the noise and drenching mist but the children were enchanted: "Magic Rain! Magic Rain!" one little girl kept chanting. Strange but true. I wanted to paint a lobster, partly because I was invited to participate in a Lobster themed show at gWatson Gallery this summer. 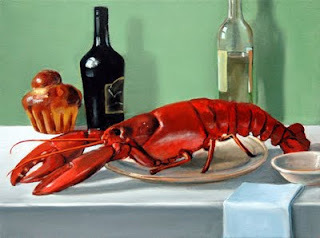 I was delighted to be invited, and actually, the idea of painting a lobster had been in my head for some time. Not surprising as I am a food painter, and I also paint in Maine! Kind of an "Oh yeah, duh!" equation. It was just a question of when I was going to get around to it, and this invitation proved the catalyst. But the obstacle: killing a lobster so I could paint her. Hmm. Lobsters go bad pretty quickly after they're cooked so I'd probably have to work fast and then end up finishing the painting from a photo: unappealing! I only paint still life from life. Plus, in any case very likely the lobster would spoil and have to be trashed, uneaten. What a waste! For all kinds of reasons I was balking. Last night was the last day of an Intro to Oil Painting class I was teaching at the Main Line Art Center. It was a talented and dedicated class and as a goodbye treat I decided we would have a *gasp* live model! We'd been working from still life set ups the rest of the class. People were nervous but intrigued by the idea! An artist friend of mine, Eliza Auth, kindly offered to sit for us: payment in chocolate and a little sketch or painting of herself. Well, so I was pretty busy helping out my students and only had time to start a very quick oil sketch of Eliza. I was a little disappointed with it and was not even sure it looked remotely like her: some payment! I told her I'd finish it up at home, and after class I brought my painting bag into the house and left it in the hall. I was pretty beat, and that's where it stayed overnight. my lovely mother-in-law Darian and my son H on the nineteenth floor of the old Bellevue Hotel in Philadelphia. H in a button-down shirt and dress slacks, a rare and beautiful sight indeed!